Fiesso shoes are those unique style high fashion dress shoes featuring wild Italian design that you see men who favor stylish dressing in all of the trendy night clubs and parties in most major cities. 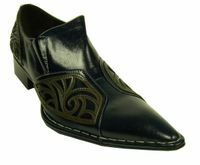 These club friendly stylish looking Italian designed dress shoes are very similar to Zota Shoes. 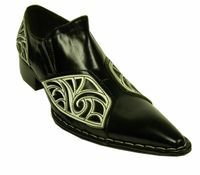 You'll find Fiesso dress shoes to be undeniable in their outrageous Italian styles featuring those long pointy toe style dress shoes that are seem to worn with both jeans or mens dress suits. Being made of rich leather with unique features like metal cap toe styles and metal rivets, these high fashion mens dress shoes are made for attention for the night club scene especially is you do it right wearing trendy style Mens Blazers. You'll even find wild looking patterns such as zebra stripes and leopard prints all with the intention of getting the wearer noticed at the club. 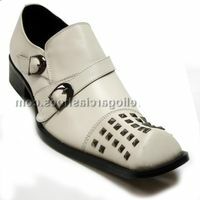 That is what Fiesso shoes are all about. If you like Fiesso shoes check out our selection of Zota Shoes. 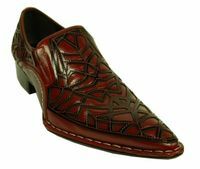 When making people gawk at the club is your goal, Fiesso Shoes are the brand to make it happen. That is because high fashion is not just a label but a whole attitude and way of club life. 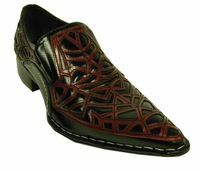 Fiesso shoes are high fashion mens shoes that feature completely cutting edge outrageous designs that are designed in Italy and nothing like Stacy Adams Shoes in style. 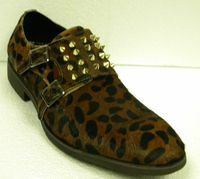 You'll see specially designed leathers in animal print patterns like zebra or leopard print fur patterned leathers. 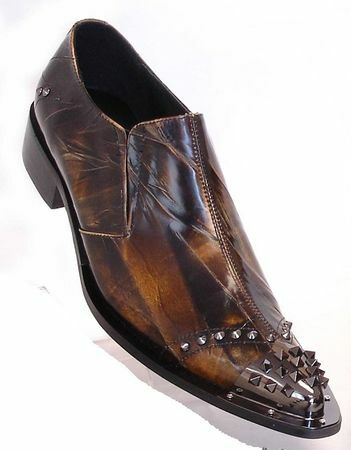 You'll also find that Fiesso shoes like to add all sorts of fancy ornamentation such as metal rivets that will be artfully designed into the shoes and metal toe caps all with the intention to add shock value when you sport them in your favorite night club. 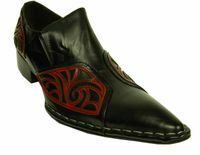 Fiesso shoes are also designed in Italy with the latest Fashion School designers that have fresh ideas in their heads all with the purpose of making Fiesso Shoe stay on top of their game.